Concrete has been a leading building material for over 2,000 years. No other construction material provides the strength, durability and economy of concrete. Modern ready mixed concrete also provides remarkable flexibility in meeting the needs of challenging placement and sustainable design considerations. We are fortunate in the concrete industry to work with an outstanding product that has served mankind for ages and yet is advancing rapidly. Nick Griego & Sons manufactures a wide variety of concrete and aggregate at several locations throughout the region. We specialize in the timely delivery of the highest quality ready-mix concrete and are capable of manufacturing products that will meet even the most technically challenging of today’s highly engineered products including light weight concrete, low water cement ratios, super plasticizer, and underwater concrete. Our computerized batching systems, complex array of admixtures and colors, and other concrete additives and materials allow us to address the entire spectrum of concrete manufacture being employed today. Our fleet of mixers and pump trucks provide pinpoint deliver. 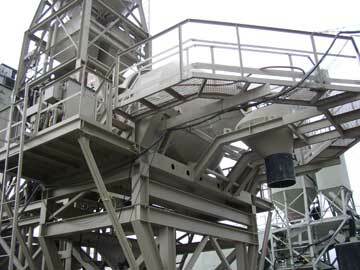 Our portable concrete batch plants allow us to place production facilities in even the most remote locations.